Ukraine Crisis: What if Novorossiya Were Full of “Texicans”? * Texican: Someone living in Texas during the time of the Republic of Texas. It was an independent sovereign nation in North America that existed from March 2, 1836, to February 19, 1846. 2014 has been the year of “Russian invasions”. But the farcical politicking and media charade surrounding Ukraine’s upheaval reminds us of the tale of Texas, and independent thinking too. Washington and Kiev would have us believe Russia invaded Poroshenko’s Ukraine. But Ukraine’s Texicans* in the east have another story to tell.Last week NATO proved once and for all, the world needs to demand more evidence before flying off the handle. You, you weary observer out there, hearken! You might be susceptible to fairy tales of mad “Bolsheviks” marching to the tune of the new and improved Nikita Khrushchev, one Vladimir Putin, but a history reset is in order. And for EU citizens in particular, before your leadership shoots themselves in the foot again (and you in the head), slinging together more disastrous sanctions for Mr Poroshenko, please allow me a moment or two. On August 28, Secretary General of NATO, Anders Fogh Rasmussen, started his war dance again. Once again, NATO revealed “irrefutable evidence” the Russian horde is descending on not just Kiev and Poroshenko, but on all Europe and the free world. But we may want to wait before evacuating Warsaw, Berlin, and Paris. The satellite images Rasmussen has shown us, turn out to be pictures of everyday life in Donbass, being on the front lines. If we are to believe NATO, we have to assume its top generals would. But I’m considering the Donbass fighters must be smarter than that. After all they’ve held out against a superior force, one more heavily armed, and one with air superiority for months now. Of course, NATO’s argument would be Vladimir Putin sent in a million paratroopers, but we’ve not seen “selfies” from them on social media yet. To solidify the situation in Urkaine, take a look at the map below showing who controls the territory. The general situation of the city of Luhansk in late July through mid August, 2014. As you can see, the city is surrounded like the Alamo was. Please ask yourself, “Where else is there to position valuable armored and artillery, but behind the front?” Looking at this strategic map, where would NATO and the “foxes” of military genius of theirs suggest Aleksandr Zakharchenko and the Novorossia go? Vastly outnumbered, bombarded to shreds, and desperate, should they mount a last fatal charge? No doubt Poroshenko would love that. The West would love nothing more than a repeat of “The Alamo” right there in Urkaine. But I’ll get to that comparison later. Could we explain Novorossia’s longevity so far on a better strategy? What about a counteroffensive via a sort of “end run” like US General George Patton made in Sicily in WW II? Rather than adopting the “Three Stooges” guerilla tactics the West suggests with their evidence, what if the freedom fighters want to stay alive? Maybe instead of the Donbass battalions plunging their best artillery pieces headlong into the waiting arms of the enemy, they moved them around behind the lines for effect? Swarming, in case you do not know, is basically what last week’s Novorossia counteroffensive near Mariupol was. The strategy involves deploying a decentralized force against an opponent in a manner that emphasizes mobility, communication, unit autonomy and coordination or synchronization. And that, my friends, requires artillery and mechanized units to drive about behind the front lines. Now you begin to see, the frenzied attempt by the West to sway public opinion. We have no pictures of hundreds of T90 tanks crossing into Ukraine. 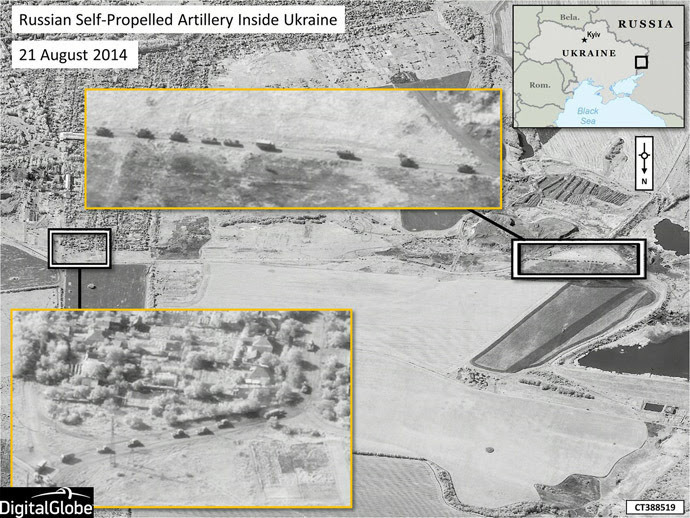 We have no infrared satellite imagery of Russian units specifically, of any kind, participating in Donbass. 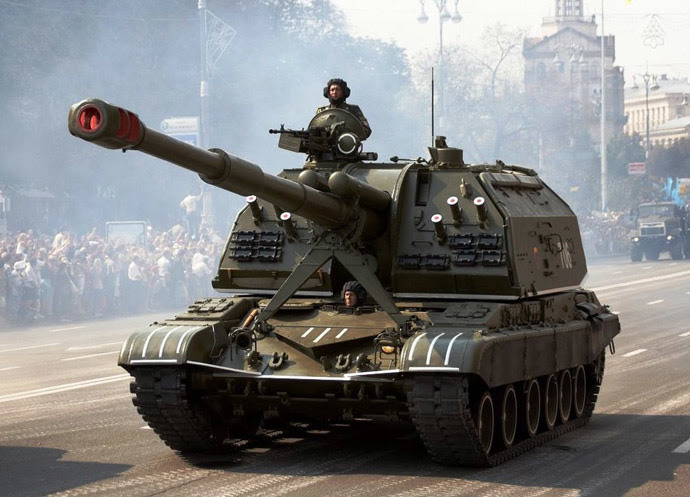 As for the ownership of the 2S19 Msta mobile artillery shown, these have been deployed prolifically by not only Russia, but Ukraine, Azerbaijan, Belarus, Ethiopia, Georgia, Morroco and Venezuela for decades now. So using NATO’s super-duper rented spy satellites was sure to turn up “targets” to incite more Washington and Brussels sanctions. The image below with my annotation in blue and red is a close-up of the situation map in late August. 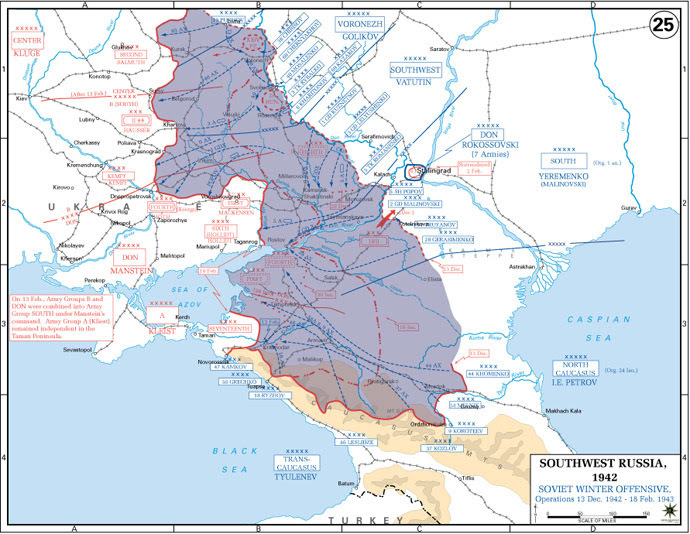 It shows Lugansk all but surrounded, and the aforementioned artillery’s location (angel). For Americans unfamiliar with the desperate battle of Stalingrad, perhaps the battle for Texas independence better characterizes Novorossia? Maybe Davy Crockett, Jim Bowie, and Colonel Travis are somehow reincarnated? We need to consider this I think. However uncertain we may be of our news and our leaders, Russia has clearly not invaded anything except negative headlines. If we can accept this, then the meeting in Brussels on Saturday to respond to allegations Russia has boots on the ground in eastern Ukraine takes on new meaning. Of course, the EU leadership is under heavy pressure from Poroshenko, the White House, and Britain to lay down a barrage of still more economic sanctions. But we need to remember that Russia’s current counter sanctions on Europe have devastated and divided the union’s citizens already. I am of the same opinion. Against his mentally disarmed foes, Vladimir Putin has no need for invasions so far. A heavily armed, US and EU backed, standing Ukraine military has butchered Donbass soldiers and civilians alike for months. All the Russian president need do in this fray is text message the separatists “great job, keep doing” to derail NATO plans. And this leads me to two final points, both of which are at once ironic, comic, and sad at the same time. First and foremost for me, the key questions arise: “What manner of desperation has provoked such hardheaded vigor by the West?” Surely only utter terror of some catastrophe could spur such irresponsible haste? Clearly neither Brits, Americans, nor the majority of EU citizens seem ready to stomach a Middle East war, let alone a continental European one. Still, the leadership and the mainstream media goes on, piling one worthless bit of proof atop another. But to what end? For this all-American boy, that’s easy as pie to understand – in Mexico, Ukraine, or on the surface of Mars. Maybe we should all think about Ukraine and Russia, like this. Phil Butler is a prolific technology, the travel industry, and news journalist and editor. He’s also a partner at one of Europe’s leading PR and digital marketing firms,Pamil Visions PR. Phil contributes to the Huffington Post, The Epoch Times in print and online, and is a regular public relations analyst for Russia Today, as well as other international media.